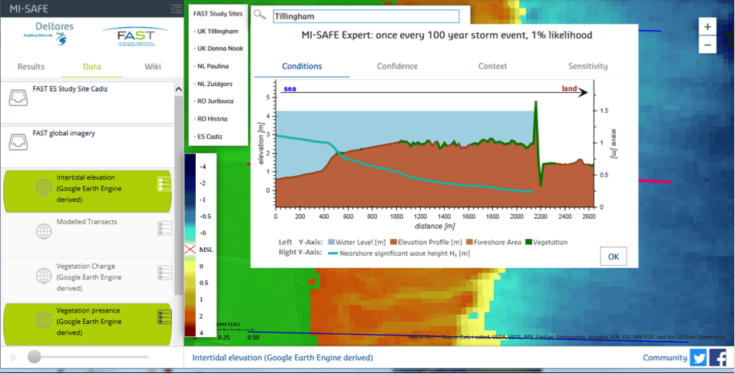 The MI-SAFE viewer is developed in the FAST project ( Foreshore Assessment using Space Technology, http://fast.openearth.eu/) and is a valuable tool to assess the presence of vegetation and it contribution to wave attenuation anywhere on the world. Data on topography, bathymetry, vegetation cover and change, storm surge and wave statistics are derived from earth observation imagery, global databases and numerical modelling. Field data collected during the FAST project have been used to calibrate our model (XBeach) and its vegetation parameters. In addition to global, large-scale data, we have derived detailed and more accurate data for specific sites (Expert Level of services). Tailor-made solutions are offered to fit the user’s requirements for implementing nature-based flood defences. This 1-hour webinar session is part of the FAST Symposium – Earth Observation & Modelling (Tuesday, 31 October 2017) during the Delft Software Days – Edition 2017 (DSD-INT 2017).